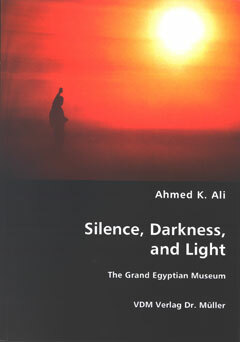 BLACKSBURG, Va., July 1, 2009 – "Silence, Darkness and Light," a new book by Ahmed K. Ali, adjunct professor of architecture in the School of Architecture + Design and program leader for study abroad in Egypt for Virginia Tech's College of Architecture and Urban Studies, has been published by VDM Verlag in Saarbrucken, Germany. The book documents Ali’s proposal for the architectural design of the 1-million-square–foot Grand Egyptian Museum in Giza, Egypt. Ali’s plans were created for an international competition to design the museum. A total of 1,557 entries to the competition were submitted from 82 countries. Neighboring a timeless wonder, the Giza Pyramids, the new museum will pay homage to ancient Egyptian monuments, treasures, and history. Ali’s design offers a strong visual linkage between the new museum site and the pyramids. The museum is slated to be completed by 2012. Ali is also a doctoral student in architecture and design research at Virginia Tech. He received a master’s degree in architecture from Virginia Tech and a bachelor’s degree in architecture from Alexandria University in Egypt.